According to Claudio Dordi, EU-MUTRAP Project team leader, the EVFTA benefits are not only limited to tariffs, but it would also contribute to eliminating other trade barriers and benefit member countries. 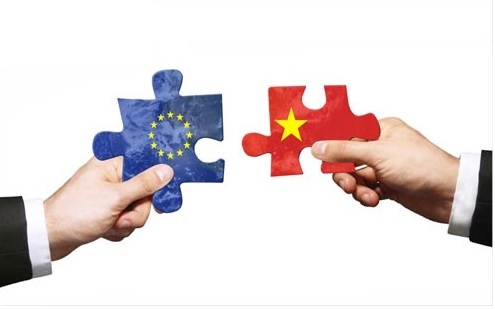 HAI PHONG - The European – Việt Nam Free Trade Agreement (EVFTA) would promote the flow of high-quality investments from the EU into the country with commitments on goods and services market access, the opening of Government procurement, investment policies and policy transparency. This was heard at a seminar entitled “European Union-Việt Nam Free Trade Agreement: What’s in it for me?” held in the northern Hải Phòng Port City to learn about what the trade pact entails. The event, jointly held by EuroCham, Việt Nam Chamber of Commerce and Industry’s Hải Phòng branch, and Deep C Industrial Zone, attracted more than 80 representatives from companies in the city, Hà Nội and from EU countries’ embassies in Việt Nam. The seminar therefore gave audiences an insight into changes in trading regulations, market access, regional implications and expectations from the European business community in Việt Nam. EVFTA will come into force from 2018, connecting Việt Nam - one of ASEAN’s most dynamic manufacturing hubs with the EU – one of the world biggest markets with GDP of over US$18 trillion, accounting for 22 per cent of the world’s total GDP and a population of over 500 million people. “EU is a common market with 28 member countries and 508 million people. Goods imported into the EU would have to meet strict standards. However, once the country meets the standards, goods will be able to access all EU member markets,” said Miriam Garcia Ferrer, head of the trade section of the EU Delegation in Việt Nam. Once the EVFTA agreement goes into effect, the EU will eliminate import duties on approximately 85.6 per cent of its tariffs lines on Vietnamese products. After seven years, 99 per cent of EU tariffs will be removed for Vietnamese products. Vietnamese textiles, footwear, and seafood products (except for canned tuna and fish balls) will incur no import duties within seven years after the agreement takes effect. Việt Nam will eliminate 65 per cent of its import duties on EU items and has drawn up a roadmap to eliminate tariffs (over 99 per cent) over 10 years. The remaining export items will be offered tariff quotas with an import duty of zero per cent. Việt Nam in the past few years has been one of the most active players in negotiating and implementing free trade agreements, emphasising its privileged position and potential in becoming the world’s manufacturing and trading hub. The EU is currently Việt Nam’s second biggest export market and Việt Nam is EU’s 11th biggest source of import. About 900 European enterprises have invested in Việt Nam, making it the destination in South East Asia with the largest European business community. This relationship has huge potential for improvement under this important agreement. It can open for European exporters markets that have FTAs with ASEAN but not with the EU, such as China, India and Australia. Rules of origin are challenges but also opportunities. They give extra incentives to attract supporting industries into Việt Nam, improving the supply chain and localisation rates.